For the most part, during taraweeh in the month of Ramadan, we weren’t distracted or disturbed by kids because they had set up babysitting in the basement for the young ones. Most obliged, and left their young kids there. Of course, there were some who must have though that their “angel” of a kid wouldn’t bother anyone… and it couldn’t be farther from the truth for the most part. One particular night near the end of the month, during prayers, and trying my hardest to not get distracted, I couldn’t help overhear a little girl crying and wandering back and forth calling out for her mother. The girl’s innocent response? “She wears a hijab“. For those that don’t get it — a hijab is a head-covering Muslim females wear. Even those who don’t wear one regularly, would indeed be wearing one in the mosque. It tastes a lot more delicious than it sounds. Trust me! It was so simple to make, and it. was. scrumptious! I don’t know if I’ve ever used that word before. But it was. The “dirt” (cookie crumbs) become soft, and melt in your mouth… so combine that with the pudding, and all I can is: scrumptious. 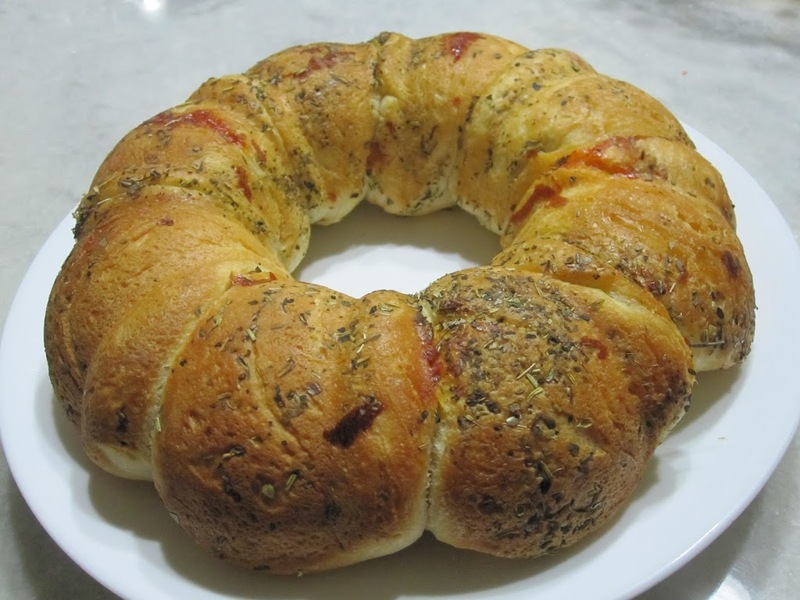 I made this the same day I tested out the Cheese Pizza Monkey Bread for the first time (which everyone LOVED)! 1 [3.9-ounce] box of chocolate instant pudding… I like to use the light version. 1 [8 ounce] container of Cool Whip… I like to use the light version. First step is to make the dirt. Can’t have dirt pudding without the dirt, now can you? 🙂 To do so, take your sandwich cookies and put them in a large resealable [Zip-loc] bag. Use a rolling pan (or something similar) to basically crush all the cookies into tiny [crumb-like] pieces… into “dirt” basically. By the way, don’t worry about removing the cream center of the chocolate cookies… once all the cookies are crushed, you can’t even tell they are there. Your next step is to make the pudding: with the powder pudding mix in a bowl, add in your cold milk. Mix it together until it is smooth, there are no lumps and all of the powder mix has dissolved. You want a consistent mixture. If you are feeling extra adventurous, make your own pudding instead of using the store-bought mix. Now, let your mixture sit for about five or so minutes while it thickens [to a pudding-like consistency]. It’s thickened? Great. Now add your cool whip and above half of the cookie crumbs. Stir, gently, your mixture together until everything is mixed nicely and you can’t see any white parts of the whipped topping popping out [and the cookies are mixed well into the mixture]. I’ve served this two different ways. In individual serving size cups, and also in one big dish. Process is similar for both, but I’ll write out both anyhow. For both ways, I like to serve them in a transparent way, for presentation purposes. Divide the pudding mixture evenly between your individual cups. Don’t fill them up all the way to the top, obviously, because you still have to sprinkle the “dirt” on top. Tip: I like to gently tap the cups against the counter-top a few times to level the pudding. Sprinkle the cookie crumb “dirt” over the pudding [so that basically the entire top is covered with “dirt”]. Pour all of your pudding mixture into a serving dish. Sprinkle, evenly, your cookie crumb “dirt” all over the top of your pudding mixture. So I’ve had this recipe saved for a while, but I didn’t own a Bundt pan. So I made this today to test out for Eid-ul-Fitr and made some changes along the way to my liking… and with a lot less butter! The original recipe called for like 5 tablespoons of butter. Yeah, not happening. I cut that down to 1 tablespoon pretty much. I think the idea of that much butter in anything that’s not dessert… is way too much! 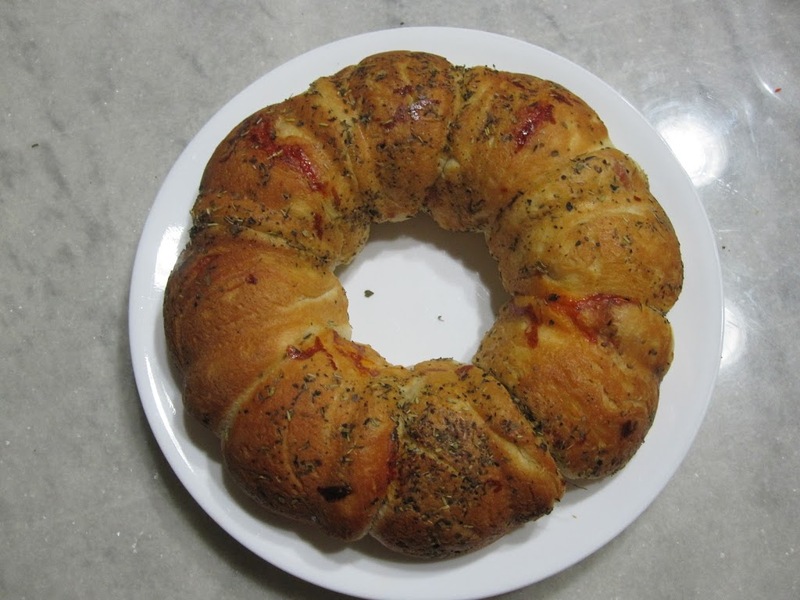 It tasted great, looked amazing… and I’m happy with the way it turned out. The family thought it was great as well, so that’s always a plus. The best part? It’s easy (took me about 10-15 minutes to prep and about 15-20 minutes to bake) and delicious! This porportion makes 8, so you can adjust according to how many you want to make. To prep the bundt pan, I spread butter on the pan and then sprinkled 1/2 tablespoon of dry Italian seasoning along the sides and bottom. Make sure the seasoning is even and spread out throughout. Melt the remainder of the butter, and keep on the side for later. Then take each of the biscuits, and at the top of the biscuit pull it apart. Make sure it’s the flaky one because it makes pulling them apart a lot easier. Then stuff the inside with 1 tablespoon of marinara sauce, cheese and any other toppings you prefer. Once you have your fillings inside, [inch the top back together to seal and secure the biscuits back up. Place the biscuits seam side up on its edge in the pan. Once you have all 8 of them stuffed, and set in the pan, brush on the melted butter on top of each of the 8 biscuits. I also then sprinkled more Italian seasoning — this is optional since when you flip the bread, this part will be at the bottom. Bake in a 350 degree oven for 15-20 minutes until the top is a rich golden brown color. Once it is out of the oven, flip onto a serving platter. With a non-stick pan, it should easily slide out. About the Bundt pan, I’d say a good non stick one would make all the difference. I was nervous about it falling apart or something once I tried to flip it right out of the oven, but it slid out so easily thanks to the non stick pan! I got mine from a local store, but I’ve linked to the same one online. Side note: is it just me or does everyone test out recipes before serving others? I love cooking and all, but I always make a test run of any new recipes and have my family try it first. 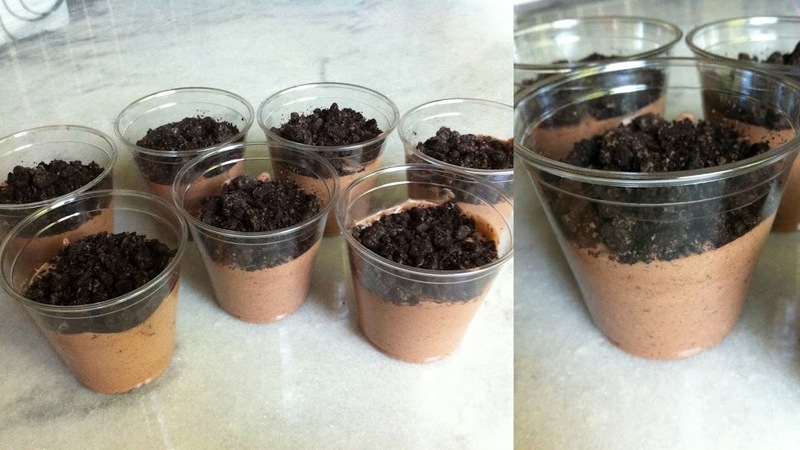 Today, I made this but made dessert first: Dirt Pudding Cups. Doesn’t sound too good, but it was also a hit!